This paper discusses the convergence of SAS software with the corporate movement to cloud computing. SAS is committed to providing our customers with deployment options that target their evolving IT and business requirements. This includes enabling SAS Business Analytics for cloud deployment. In addition, this paper provides a summary of terms and concepts within the paradigm of cloud computing and “as-a-service” delivery models, focusing on different options and what SAS offers. Because virtualization enables the creation of flexible clouds with elastic computing resources, this paper presents a high-level overview of that technology. Other elements needed for successful cloud computing, such as security, data management, scalability and policy-based compliancy, are also addressed. 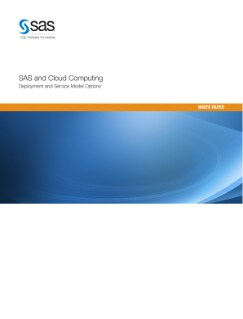 After reading this overview, we hope you will work with SAS to plan a cloud strategy that is best suited for your organization.